Beginning in 2013, the Chamber began to report annually on the work accomplished in the previous year and the goals for the upcoming year. In true Capitol Hill fashion, we chose to make this the biggest and best social event of the year for our members. Great food and sweets from Vostok Dumpling House, Quinn's, Barrio, High 5 Pie, Poppy, Hello Robin, Chico Madrid and Capitol Cider. None of it could have happened without the help of our wonderful sponsors: Hunters Capital, The Nesteggg Group, WG Clark, Capitol Hill Housing, The Wolff Company, Barrientos LLC, BECU, Sound Transit, Schemata Workshop, Studio Meng Strazzara, Board & Vellum, Seattle Academy, Capitol Cider, Group Health, The Lyric, Ragen & Associates and Rancho Bravo Tacos. State of the Hill 2014 from David Albright on Vimeo. 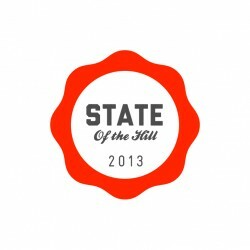 State of the Hill 2014 - Full Address from David Albright on Vimeo. On February 7, 2013, Executive Director Michael Wells declared that the State of the Hill was: Strong, Vibrant and Fabulous.